Berlin (VNA) – The Vietnamese delegation, as an invited guest, has called for G20 countries to promote inclusive development at the third G20 Sherpa Meeting in Munich, Germany, on May 18-19. G20 members should promote inclusive development across economic, financial and social aspects to ensure everyone benefits from economic achievements, financial access and social equality, the Vietnamese delegation head, Foreign Minister Assistant Vu Quang Minh said during discussions on the 2030 Agenda on Sustainable Development. He spoke highly of G20 countries’ efforts to ensure global health and fight against diseases, affirming that global cooperation is crucial in preventing antibiotic resistance and needs to be included in the meeting’s joint statement. On the digital economy, Vietnam proposed that G20 establish a global forum on start-up to share experience in promoting and supporting start-up enterprises. The Vietnamese official also asked G20 countries to step up policy coordination with regional and international institution and forums, including Asia-Pacific Economic Cooperation (APEC) forum and the Association of Southeast Asian Nations (ASEAN), to boost rapid and sustainable global economic growth. Mentioning food and water resources security, he suggested G20 promote regional and global partnership for the sustainable use and effective management of water resources in order to deal with the closely-knitted challenges related to food, water and energy security. At the meeting, participating countries and international organisations agreed to intensify cooperation in health, employment, gender equality, finance and banking, and money laundry and corruption fight. 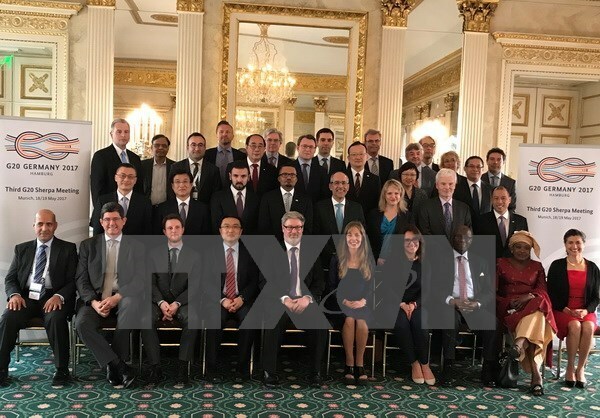 They concurred to hold more discussions on issues related to the 2030 Agenda, global supply chains, migration, climate change, energy, trade and globalization, with the aim of reaching agreement for the content of documents of the G20 Summit, which will be held in Hamburg, Germany in July. G20 gathers the world’s largest economies, which account for 80 percent of GDP and 75 percent of trade of the globe. Besides Vietnam, guest countries at this year’s event were the Netherlands, Norway, Singapore, Guinea and Senegal.